University of Thessaly, with 18 Departments and various Research Centres, is a University with its own identity and with a prominent position in our national educational system. It was established in 1984 as University Of Thessaly (Presidential Decree 83/1984). Its administrative and academic centre is in the City of Volos. 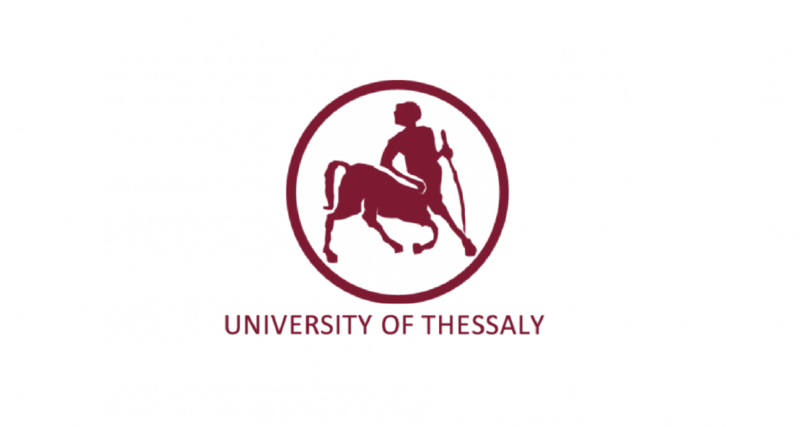 The University of Thessaly is extended over the whole Region of Thessaly with academic Departments in Volos, Larissa, Trikala, Karditsa and Lamia. University of Thessaly provides undergraduate and postgraduate programmes and extra-curricular modules in specific research and business fields, for over 12000 students. The main mission of the University of Thessaly is the promotion of scientific knowledge through research and the contribution to the cultural and economic development of the local community and wider society. It is known for its excellent research performance and outstanding scientific achievements, in accordance with the international standards. As part of its future goals, University of Thessaly intends to strengthen its cooperation’s abroad, increase its human resources, upgrade and utilize existing human resources, attract young scientists and encourage research through the creation of modern research structures, increase infrastructure and utilize its assets and funds from the EU with the research programmes RFSR, FP6, FP7, INTERREG and LIFE. The members of the academic and research staff participate in European research networks and numerous innovative research projects in the EC. Emphasis is also given on the bond between the University of Thessaly and the local society. This bond is further supported by the operation of the University Hospital of Larissa which covers the medical needs of the whole region of Thessaly. The University brings also students in contact with the labour market through its LIfelong Learning Center. As one of University’s central institutions, the Lifelong Learning Centre of University of Thessaly supports all major processes at the University and provides basic and individually tailored training and employment services in all the relevant to Institution’s basic scientific fields. The Lifelong Learning Centre of University of Thessaly is basically associated with the planning, the organization and the coordination of various continuous vocational training for all the associated target groups (students, graduates, youth groups, researchers, business organizations, etc.) as well as managing the effective transition of its graduates to the labor market. Being concerned with problems related to labor market, jobs availability, young entrepreneurship and student mobility, one of the main objectives of the Lifelong Learning Centre is to become a permanent link between the University and the business community through training services related to all fields of knowledge provided by University of Thessaly. Certified by the National Organisation for the Certification of Qualifications & Vocational Guidance (EOPPEP), the Lifelong Learning Centre also provides an e-learning platform aiming to enhance the educational process through the provision of a dynamic interactive environment. As part of the activities and the fulfilment of its targets the Lifelong Learning Centre on its own initiative implements various projects, which have as a main target to reinforce the development of new instruments and innovative solutions related to the office overall objectives. The experienced team of Lifelong Learning Centre has participated with great success in a large number of programs related to education, training, entrepreneurship and mobility. Actually the intensive project implementation has become one of the core activities and basic philosophy of Lifelong Learning Centre during the last years revealing the Center of University of Thessaly as the only similar institutional body with such an intensive project orientation. The scientific and qualitative implementation of the training programs is well ensured from the integrated contribution of all the faculty and the rest of the research staff of the University of Thessaly.